A while back, I discovered a brand which I have grown to love through blogging. Neocell started in 1998, is now "Today, the #1 collagen brand in the world and a leader in the field of nutritional science." When I first heard the mention of 'collagen' it made me think of botox injections and all those vane celebrities trying to look younger and more beautiful. But that changed when I started researching and reviewing the products from NeoCell. I quickly learned that I was the one being vane thinking about nothing but beauty. "Collagen plays in strengthening and rebuilding loss muscle mass and improving connective tissues". I recently had the opportunity to work with Neocell again on some of their new beauty products. 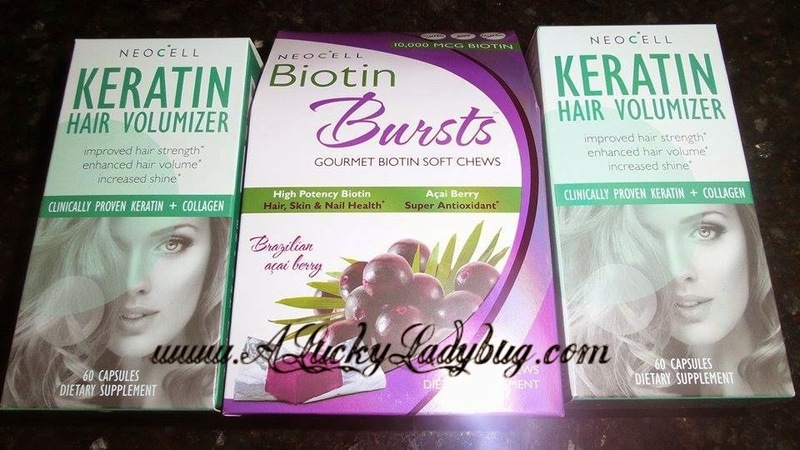 I was sent over the Biotin Bursts in the Acai Berry flavor and the Keratin Hair Volumizer. Because Biotin is an essential vitamin in healthy hair, skin and nails, the Beauty Bursts contain 10,000 MCG of Biotin per chew. Because of this they have similar affects and are great for overall body health. What I liked most about these is that they double as a healthy snack or satisfy your craving for something sweet while maybe dieting. The Acai Berry flavor Beauty Burst were fruity and tasted great! Between the styling or dying I have done to my hair over the years, my hair has taken a beating. I miss being pregnant for the sole reason it was the healthiest my hair and nails ever were. 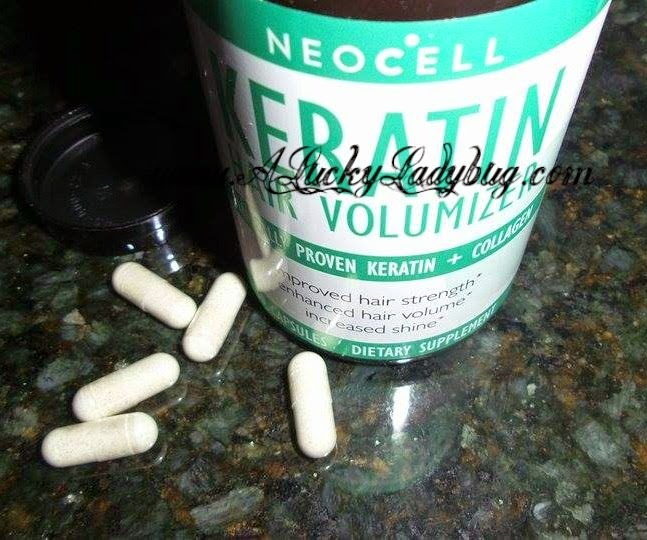 The Keratin Hair Volumizer thickens ﬁne hair, adds body and even slows down hair loss. My hair felt great after just using this for a few weeks, definitely less frizz that's for sure! Honestly, my nails have even started growing a bit faster too. Recommendation: I thought these were great products which actually did what they claim! I can't imagine how well they will work after taking for a month. The prices are very reasonable. Neocell carries quite a few products all at great prices that I would recommend checking out their selection when you have some time (especially you beauty queens and fitness nuts)! Giveaway: NeoCell is going to give one of A Lucky Ladybug's lucky readers the same set of beauty products of their own! I am most excited for the Biotin Bursts. I am most excited about the biotin bursts, they sound like they would be a great daily addition to my diet. I'm not sure how this whole thing works. I'd love the bedding. This too. I have alopca arete and my hair is in bad shape. I am most excited about the Biotin bursts. The flavor sounds delicious and like something I could remember to take ever day.